Nowadays, it is nearly impossible to find a supermarket that does not have a shelf devoted to plant based milk. The product has been widely accepted shortly after its launch and its popularity has been on the rise even since. Despite its name, plant based milk is not milk per se. Neither by nutritional composition nor by mode of production… And that is the beauty of it! You get all the benefits of cow’s milk, but spare yourself the drawbacks. The most prominent aspect of non-dairy milk is its production. There is no animal cruelty involved. Plants are cheaper to grow. Pound for pound, soy, almonds, flax, hemp, cashew and all other commonly used plants require less space, water, equipment and human maintenance than dairy producing livestock. On top of that, you get a product which is free of antibiotics, hormones or any other unhealthy additives that come with dairy. You would be doing yourself and the environment a favor by incorporating plant based milk into your lifestyle! A common concern with all non-dairy diets is the risk of a calcium deficit. This is a serious condition which can lead to many health problems within the body. Bone density decreases, blood pressure becomes unstable, risk of osteoporosis, the list goes on and on. Fortunately, plant based milks are rich in calcium with some varieties (e.g. soy milk) even surpassing the calcium content of dairy milk. What’s more, because of the vitamins that come from the plant, calcium is better absorbed by the body and more efficiently transported to the cells. 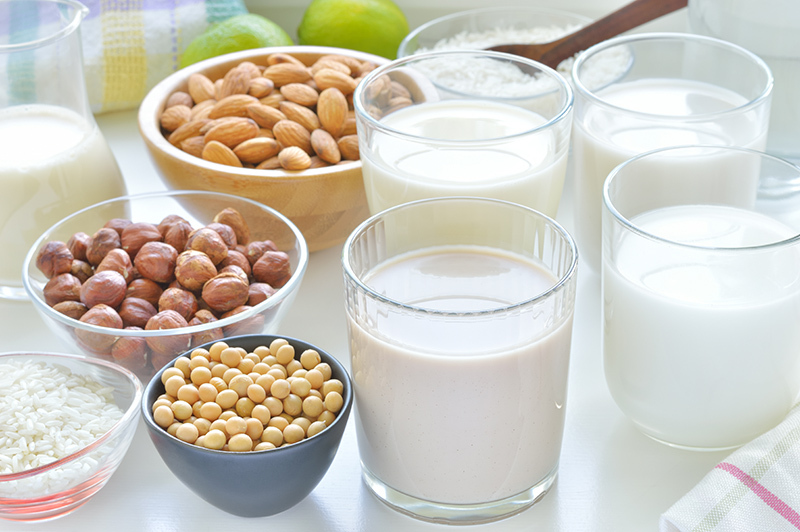 Some non-dairy milks are in fact low in calcium, such as almond milk or rice milk, but they often come enriched with antioxidants, vitamins and minerals to compensate. These products can also be a substitute for milk in many common recipes and one would be hard pressed to notice a difference. They can be used in baking, added to the blender when preparing a shake or as cream to your coffee. Not only is it healthier, but it would also enhance the flavor giving a much richer taste. Speaking of healthy, plant based milks inherently contain much less sugar. The nuts they are made of have more omega 3 fatty acids (hemp milk), more fiber (oat milk) or more protein (soy milk). Many people are intolerant to the sugar in cow’s milk – lactose. It most commonly causes digestive issues, but can also be responsible for an allergic response. To avoid this, we commonly buy lactose-free milk, which has gone through yet another processing step to have its sugar removed. A general rule of thumb is, the more a food has been processed, the more it loses its nutritional value. In this sense plant based milk is definitely the healthier cow milk alternative. It undergoes minimal processing. It is naturally low on sugar and consequently on calories. For people with nut allergies there are plenty, equally natural and healthy alternatives. Many of the brands out there are certified organic and GMO-free. However, some caution is advised when browsing the shelves with plant based milks. Always be sure to read the labels and nutritional facts. Some products may come with added in sugar, which you might want to avoid if you are watching your weight. Sweetened drinks are a commonly overlooked source of empty and excess calories. Another additive to be on the lookout for is Carrageenan. It is an emulsifier that some brands add to their non-dairy milks to make it creamier and thicker. Unfortunately, it has been linked to several digestive tract issues such as stomach pain, bloating and gas. For these reasons you should avoid any products containing carrageenan. Plant based milks have become a staple product for the vegan lifestyle. Even if you are not looking to join that community, but are simply interested in improving your own health, supporting the environment or opposing animal cruelty, non-dairy milks are a step in the right direction!